“Handle with care” takes on new meaning when you’re lifting a structure equal to the weight of about a dozen elephants. 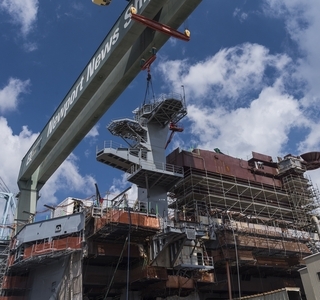 More than 30 shipbuilders assisted with the placement of the upper-level structure that is part of USS Abraham Lincoln’s (CVN 72) refueling and complex overhaul. While they may appear to be beneath the massive structure, the shipbuilders are actually standing out of the path of the unit. Photo by John Whalen/HII. 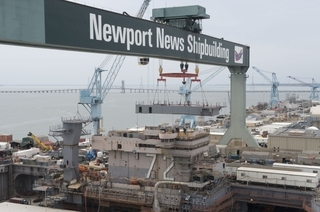 NEWPORT NEWS, Va., April 30, 2014 (GLOBE NEWSWIRE) -- Huntington Ingalls Industries (NYSE:HII) announced today that its Newport News Shipbuilding division recently placed a new upper-level structure on top of USS Abraham Lincoln's (CVN 72) island, which is similar to an airport control tower. The aircraft carrier is undergoing its refueling and complex overhaul (RCOH), during which the shipyard refuels the ship's reactors, paints the ship's hull, modernizes systems and performs a complete recapitalization of the entire ship. The structure, which will contain the ship's primary flight control systems when outfitted and serves as the platform for many of its various radars and antenna systems, is one of the largest structure lifts that will be performed during the RCOH process. At 88 feet long and 32 feet wide, the structure weighs about 68 long tons, which is equal to the weight of nearly a dozen elephants. It was set into place using the 310-ton gantry crane that straddles dry docks 10 and 11. 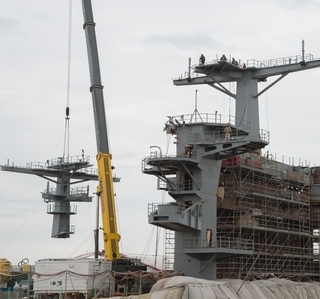 "An RCOH is an extremely complex engineering and construction project that requires more than 30 months of advance planning and more than three years to accomplish," said Chris Miner, Newport News' vice president of in-service aircraft carrier programs. "This lift represents just one of many significant events we complete to return this ship to the Navy fully equipped and modernized to defend our nation for another 25 years. I applaud the thousands of shipbuilders who are working tirelessly to safely return this great ship to the Navy on schedule and within budget." USS Abraham Lincoln arrived at Newport News in March 2013 and is on track to redeliver in 2016. 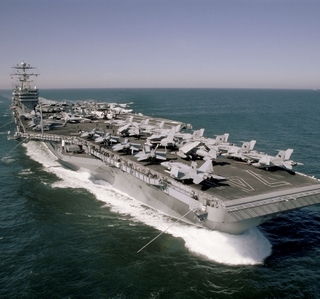 RCOH is the mid-life refueling overhaul and maintenance availability of a Nimitz-class carrier that produces a recapitalized carrier capable of supporting current and future warfare doctrine and continuing to operate as the centerpiece of the U.S. Navy fleet and national defense for another 25 years.